Welcome to South West Road Runners, one of the largest running clubs in Devon. 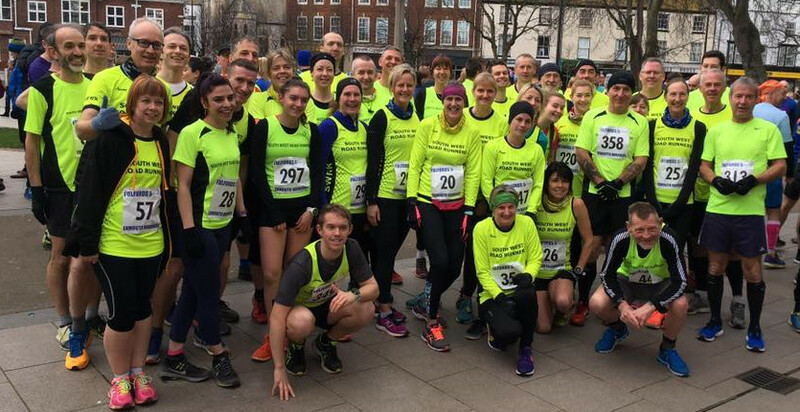 Since forming in Exeter in 1984, we now have more than three hundred members, organise two high-profile races each year, and offer runners of all abilities the chance to enjoy and improve their sport. Here, you can find out more about our club, our races and what we do. Please contact us if you need any more information, or just come along and join us if you fancy a run. The South West Road Runners were formed in 1984 primarily as a road running club. Since its move to the old Clifton Hill track and then to the new synthetic track at Exeter Arena in 1992 there has been a broadening of the Club’s activities to include cross country, trail running and triathlon. The Club now has some 300 members, roughly half men and half ladies. We take runners from the age of eight years of age, although the great majority of members are now approaching their athletic ‘maturity’! Despite our name we don’t just specialise in running on the roads. Many of our members can be found competing in cross country or taking part in mult-terrain events or fell races. We also welcome a whole range of abilities, from those who want nothing more than a social jog around town, right up to county representatives and international Age Group duathletes and triathletes. We’re also the only club in Devon and Cornwall to regularly enter a team into the prestigious Welsh Castles Relay Race.